I was recently sent an email from a marketing company asking if I wanted a sample of their product to write about. I love free stuff; I kept reading. The product also happened to be one of my favorite things. 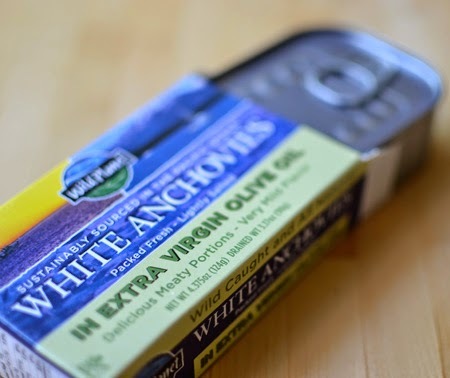 White anchovies from Wild Planet Foods, based out of McKinley, California. Mark and I had our first white anchovies when celebrating his 50th in Vernazza, a village in the Cinque Terre on Italy's Riviera. We had walked to Corniglia - a neighboring village on a cliff overlooking the Tyrrhenian Sea - and found a little restaurant called La Cantina de Mananan. It still is there - in fact, my friend Carol was just there last year. We ordered a feast and happily, before the order was submitted to the kitchen, we asked if they accepted credit cards. Good thing we asked! Our feast was scaled back but in no way did we suffer! Our server made a few suggestions and we ended up with one of our favorite meals ever. And, believe me, no one starved! It started with a "Tris di Acciughe" or, a trio of anchovies. Until this time, we were only familiar with the mealy, intensely salty tinned variety used on pizza here in the States. We had never thought of them as fresh, fried, or pickled. The trio included four varieties (maybe the chef couldn't count): fritti (fried), con peperoncini (with chile flakes), al limone (“cooked” in lemon juice), and accciughe bianche (white anchovies). The latter were preserved in olive oil, lemon, and oregano. They were like no anchovy we had ever eaten. We loved them. So, when I was offered a sample of Wild Planet white anchovies, I jumped at the chance having great expectations that these were the same kind of fresh bright silvery fish we had in Italy. That is the funny thing about expectations... they can really throw you a curve ball. The anchovies from Wild Planet are nothing like those in the Cinque Terre. But they are delicious! This is yet another variety of anchovy that has surprised and delighted me. 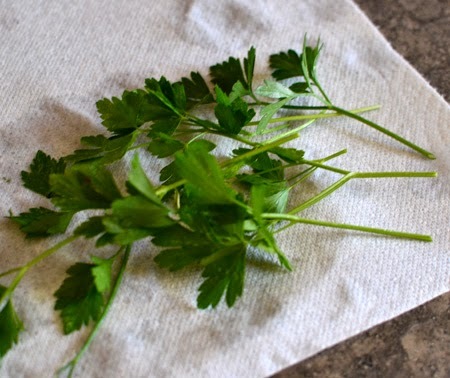 I had expected to use them in some sort of salad-like dish but, once opened, my path changed. These are incredibly meaty, sweet, and mild in flavor, certainly not your local pizzeria's salty topper. After tasting one, I had visions of pasta. A sweet pasta with a Sicilian touch. I raided the pantry and came up with this pasta dish. If you don't like anchovies, that is all the more reason to give these a try. 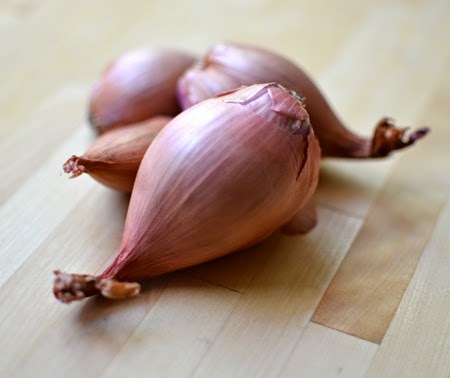 I can easily imagine having these with a slice of tomato on fresh bread as a cicchetto, or mashed into a paste, mixed with breadcrumbs and celery and stuffed into calamari. How would you use them? All Wild Planet products are available online through their website, as well as at most Whole Foods and Sprouts markets. The company is committed to producing the finest tasting wild seafood sourced from fisheries practicing sustainable fishing methods, in an effort to preserve the fragile marine ecosystem and aid in the repopulation of endangered species. With a mission and vision like that, who wouldn’t want to try their products? Bring a large pot of water to a boil. Add 2 tablespoons salt, and then pasta. Cool until al dente - about 10-12 minutes, depending on the pasta. While the pasta is cooking, heat the olive oil in a skillet and add the slivered shallots and sultanas. Cook at medium heat until the shallots are soft and turning golden. Add the pine nuts and cool for another few minutes until they are lightly toasted. Add the Marsala and let reduce by half. Add the anchovy fillets (I removed the bones), orange zest, and parsley. Mix gently and remove from the heat. When pasta is ready, reserve 1/4 cup cooking water, then drain the pasta and add it to the skillet. Return to medium-high heat. Toss gently and add reserved cooking water. Divide between two pasta plates and serve immediately. And, as with all Italian seafood and fish dishes, just say "No!" to the cheese! Serves 2. Recipe can easily be doubled. 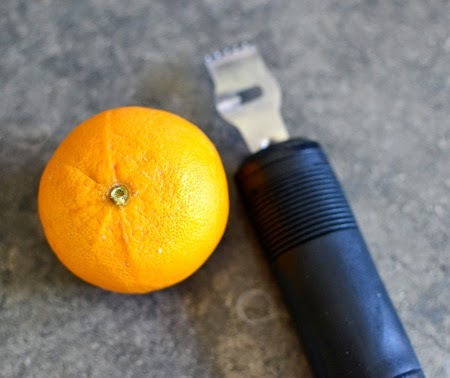 Another great post David, the food in Italy sounds wonderful, so simple and fresh. I love dishes like this, the ingredients speak for themselves. Thanks so much, Cheri! The simplicity of Italian food is what really makes it special to me. Each flavor is so important. I didn't know there were so many varieties of anchovies. I also am only familiar with the ones we used to get on pizza so consequently they have never been on my cooking radar. 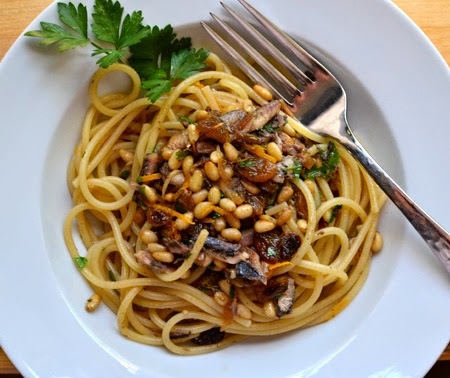 This recipe has inspired me to give the humble anchovy another go. Karen - if you can't find these kind of anchovies, this dish would be great made with tinned sardines, too. I bet Peter woudln't even notice the anchovies in here - they fall apart and just make for a great sauce! The thing I love is how simple this is! Believe it or not, I just ate a tin of those last week (bought them at Sprouts). But, I ate them plain. They look so much more delicious and amazing in your recipe, so I'm going to have to try it. They are good plain, aren't they? Wynne - you are always so kind about my photos and recipes. Now, when are we going to get you two here for dinner? This looks delicious. i will try making this soon. Yum. Thanks, Carol! It is pretty simple - and can be made with regular raisins, currants, figs or apricots! 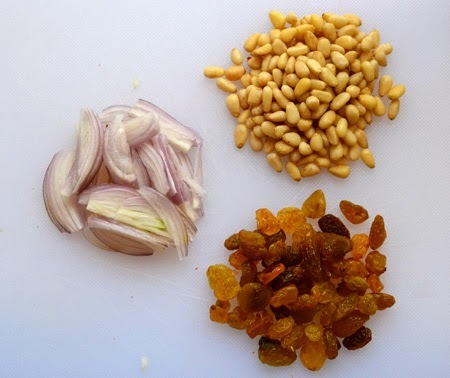 And if you don't have pine nuts, slivered almonds would work well, too. 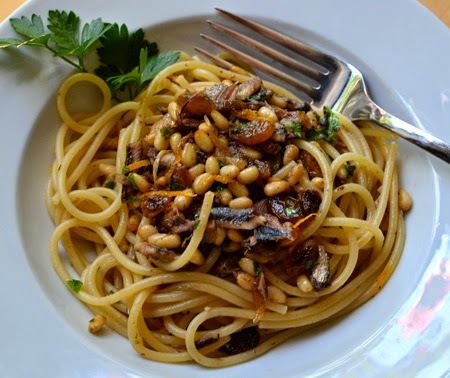 The first time we had white anchovies was in Italy, too! They were freshly filleted and served with a touch of olive oil, lemon, and salt - and just delicious! These do look far better than the oily salty anchovies you usually find in the States. 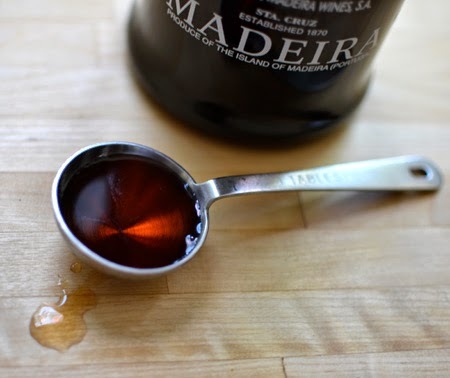 And, I love pantry meals - between the Madeira and touch of orange, I'll be this dish is great. I hope you keep getting free stuff. Even though I sometimes feel pressured to create something wonderful, I think it's fun - and a great way to increase exposure to your blog. Those first white anchovies in the Cinque Terre were a revelation! Where did you have yours, Susan? I never thought about it - but you are right. This is the perfect pantry meal! Those are often the best. Who knows about the free stuff... I have been offered some that I refused - not up to the integrity of the blog! But whatever comes, is fun! Thank you, dear Rakesh and Swikruti, for your inspiration. I would have never thought of a coconut milk-based curry for them. Brilliant idea! Thank you! The only time I've used anchovies is to add them to a sauce base. I've never really tried them straight up. I'm afraid. I'm not a seafood, esp fishy seafood person. I'm willing to try these mild ones if you tell me they're not fishy tasting! I've been thinking about eating these esp for my joints, I figured they might help. I'll check Sprouts but I know I've seen them, I prolly even picked some up to read! I know the rules with seafood and cheese with Italian food, but I just can't help myself with parmesan on any pasta. And that includes seafood. And yes, I see the similarity in your pasta dish to the one from Sal's Place in Provincetown. Except you haven't gone overboard with the pine nuts, as they did. I swear there was half a cup in our one serving! I knew there would be at least one cheese renegade out there! Glad it's you! There weren't that many pine nuts on our servings (which was long ago) - maybe you caught the chef's attention and s/he wanted to send you something special? David, this one looks DELICIOUS. I'm willing to give it a go! Colette - I am really looking forward to your doggie treat post! I hope you enjoy the anchovies! 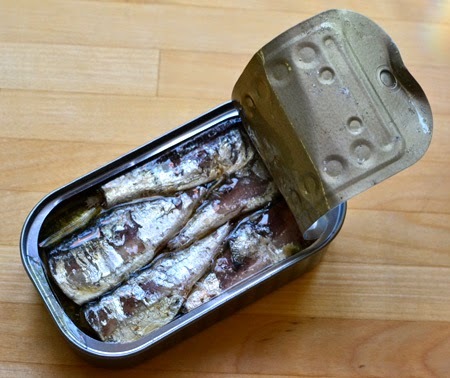 Marco - you should preserved sardines in place of salty anchovies. You have such better fish options there than I could ever dream of! PS No matter how many times I (you or somebody else) states that white anchovies ARE NOT salty like cured anchovies, people always assume they are. Why don't people believe?? Taste– don't assume. Rant complete. Sorry. Greg - rant accepted and appreciated! Do they think we lie to them? 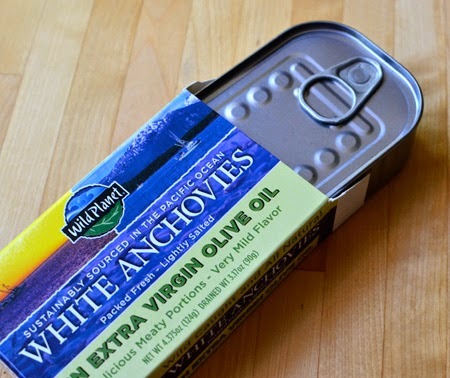 You were the first person I knew who used these white anchovies and they are much closer to sardines, which I also love. The white anchovies I got in Italy (in oil, lemon and oregano) actually are readily available here, which makes me very happy. Thanks, Laura - as you are not able to get this variety in Australia, you can use tinned sardines for this recipe. They will work beautifully. I hope, though, that someday the Italian white anchovies in olive oil, lemon and oregano come your way. They are a revelation. This pasta dish looks wonderful and I will definitely visit their website. How would these anchovies work for a pissaladière? Susan - I actually think that oil-packed anchovies work best for a pissaladière. These just wouldn't have enough oomph for all the onions and olives. Fiona - on Facebook someone asked what they could use in place of the raisins and I thought wither diced figs or apricots would work well. Will F eat those? As I checked my upcoming posts, I realize that I almost had three anchovy posts in a row! Probably too much for an anchovy-shy public. Glad you like them! I like the idea of figs (or apricots)... thanks for the tip! He will seriously eat anything else the planet has to offer... sometimes even raisins if I can hide them somehow, but here they would shine through too much. Regarding your posts, I think it is good to evangelize anchovies... such an abundant, healthy and cheap fish, at least in this part of the world. Wow, if raisins are the only thing, you are pretty darned lucky, Fiona! Currants work well for this, too. I always forget to say that. Not so much dates... I do love, love, love anchovies but I know a lot of people don't. Wish they would just give them another try. David, when I look at your pasta, I begin to wander why we are all so hesitant about those anchovies...it looks quite different and wonderfully delicious - while I am not so sure that my kids would go for this but I certainly would - do not think that I have ever come across the white variety, will have to keep my eyes open. With the sweetness of the raisins, your little ones might just like it! Yes, very busy these days - but surviving! Thanks for asking! I love sardines and love Wild Planet. And this is my favorite way to eat them. Perfect. This was my first intro to Wild Planet, Valentina - and now I get their products all the time. Such a difference! Jaja Paula - you will want to leave the anchovies off today's recipe, too! :) Hope all is well - miss you! So good to know about anchovies!!! And a beautiful pasta dish! Thank you for the inspiration! Thank you, Chef Mimi, for stopping by!